This is the fortieth page of photographs of Boston Whaler boats that I have had the pleasure to publish. What has made this possible over the last year or so has been the contribution of so many excellent images of so many excellent Whalers. Initially the pages of CETACEA were just collections of various shots of Whalers, but as the collection grew, I tried to develop a theme for each new page. Sometimes just a single boat or event would take over a segment. 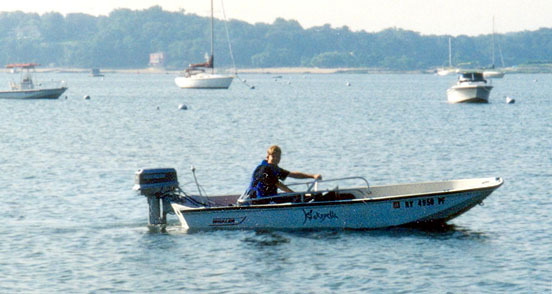 In this installment, I revert back to the earlier style, just a collection of images related only in their common subject matter: the Boston Whaler. "This photo was taken on May 18th, 1991 at Neah Bay, Washington, which is at the extreme Northwest corner of the Olympic peninsula, by Tim Dahl from a companion Outrage 18 owned and piloted by John T. Pope. In the photo is my brother Bruce T. Clark, driving, and me, hanging on with one hand. "This was our first fishing trip of the season. It was also the first time John Pope had had his boat out on an 'expedition.' I had just talked him into buying it that spring. Ostensibly, our goal was the Swiftsure Bank about ten miles off the coast where we hoped to fish for halibut. As we rolled into town about noon, the weather turned out to be quite pleasant, high overcast, filtered sunshine, and surprisingly little or no wind. It typically blows out there. But it had been blowing out on the Pacific and there was a huge swell rolling into the straights. The word on the docks was "Don't go out. It's too rough." Well, I've got a Whaler and I always go out. Hell, I like it rough! Since John and Tim had never been out there and trusted my judgment they figured it must be OK, too. "So we went out. As we rounded Waadah Island, which guards the entrance to Neah Bay, we discovered that in fact it was pretty darn rough. Complicating the huge swell rolling in was the fact that the tide was ebbing. This sets up a very short wave length and bunches the waves up. On this day the waves were breaking, which is something I had never seen before in waves this size. It was really like enormous chop! Now I know how hard it is to judge wave height objectively when you're in it. The others were saying the waves had to be 12 or 15 feet. I myself would judge them to be more like 8, maybe 10 feet. I say this because I stand about 6' 2" and the cockpit sole of an Outrage on plane is at about water level. In the troughs I completely lost sight of the horizon on every wave and was looking up at quite an angle on the biggest waves. But the tops of these waves were tumbling into whitewater! "I had the motor trimmed all the way in in an effort to achieve the absolute minimum planing speed. Even at that we were flying off the tops of the waves. John later said that he and Tim thought it was really rough but hey, if Tom keeps going I guess it must be OK. Tim is a pretty good photographer and we tried to run the boats close to one another for the photo ops. He took quite a few photos but it was tough. This is really the only decent one. "At the moment this photo was taken the boat is coming down. As you know, it is very hard to see big seas in a photo, but you can see the last of the ridge of the wave right about where the stern of the boat is. Remember there is an 8 or 10 foot deep hole on the other side and the bow of the boat is about 8 or 10 feet above the stern. My poor boat had a hell of a long way to fall, and fall it did! Crash, more like it. It was brutal. "We went on for about two miles and then I decided it was just too ridiculous and we turned tail and ran for Sekiu, about twelve miles East where we fished for Blackmouth (immature Chinook salmon) the rest of the afternoon. I actually caught one too, so all was not lost. "I'll tell you, surfing those big waves was fun! I really thought we would drive the bow of that boat into a trough and ship water into the boat, but that just never happened. 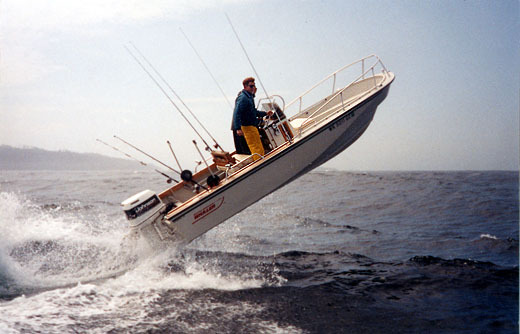 In the ten years I owned that boat I never did and it never broached. (And I have broached my 12-foot Lund with its 9.9 dumping me and my companion into Puget Sound) It's like the Whaler is on rails when going down wind. You can drive it right up to the rub rail but never bring green water onboard. In this respect I think the 18 Outrage is nothing less than extraordinary. "It was not the most scared I've ever been out on the water in a Whaler, but it is the one time I have ever turned around." 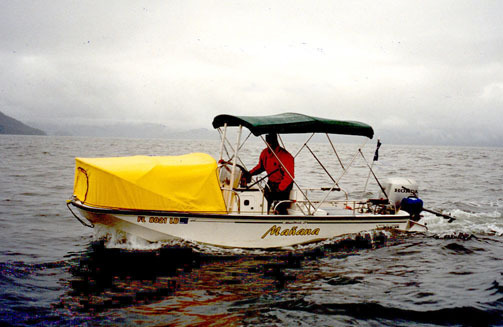 Large Pacific Ocean swells off Neah Bay, Washington, get some air under the 1983 Whaler 18-Outrage. Aboard are brothers Bruce and Tom Clark (foreground). If you study this picture carefully you'll see that the boat is jumping off a wave crest, and its landing will be about ten feet lower into the trough. Ouch! Ran across your web site, and being a Whaler enthusiast, I really enjoyed it! Enclosed you'll find a picture of me aboard MAÑANA while on a six-week trip last summer from Prince Rupert, British Columbia, to Skagway, Alaska, and back: 1178 miles. This classic Whaler Montauk is homeported in Lake Montezuma, Arizona, registered in Florida, and seen here cruising the coast of Alaska!. A Honda 4-stroke and auxillary engine, Bimini, and Forward Shelter turn this Montauk into a long-range mini-cruiser. into about5ft. waves and got mad air. rewrite what I said if possible. A 13-year-old skipper, a 17-year-old boat, a 43-year-old design, and a timeless concept. "Here are a couple of cheery looking New York State ENCON officers in their [21-Justice?] 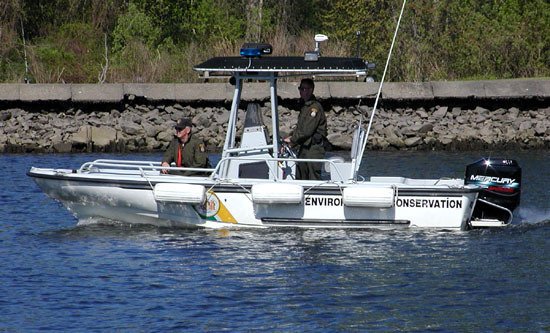 checking Hudson River boaters for life preservers. Photographed Sunday, May 6 just a few hundred yards south of the Town of Bethlehem launch ramp. The striped bass are running and the river is full of all kinds of boats and boaters. After they saw I was taking their picture, their expressions loosened up a bit as you can see. "These guys were all business and expressed little interest in my Outrage. When asked how they liked the [EFI 225] Merc, they responded that it was great. Only complaint that it tends to load up after prolonged operation at low RPM." Imagine getting paid to cruise around in a nice Whaler with 225 HP on the transom. You'd think you'd be having more fun than this. The page has been accessed 86115 times.